Kristy is an exceptional cook and her creations are far more delicious and elaborate than her husband, Dave deserves. But Dave is as saucy as some of the meals he gets, so he often makes comments and jokes about Kristy's cooking. Kristy knows how much Dave loves her food, and she takes it all in stride, but she also has a saucy side. She also knows that giving her husband exactly what he asks for might just be the best lesson possible. After a particularly busy day, Kristy mentioned that she had lined up sausages for dinner with some potatoes and vegetables. She was looking for something quick and easy, and she had already been cooking all sorts of tasty dishes in the days leading up to this. Dave pretended to be disappointed and he told her that plain old sausages would just have to do if there was nothing fancier or more exotic on the menu, as he had grown accustomed to. Kristy and Dave had recently been to the Galapagos Islands and had seen all sorts of wildlife, including the giant Galapagos tortoises. He watched in amazement as Kristy constructed a large tortoise using the sausages and some bacon. 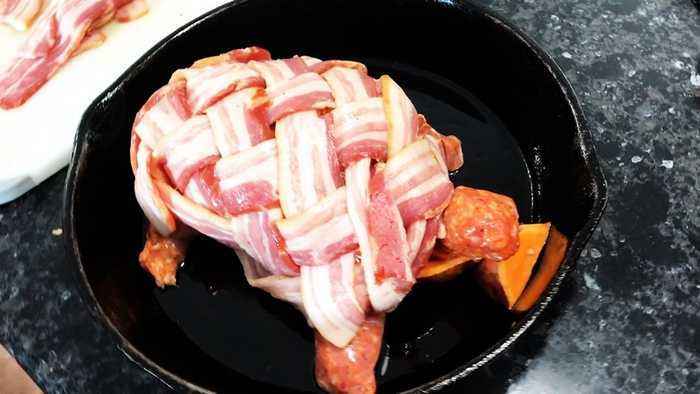 She weaved the strips of bacon together to make what looked remarkably like the shell of a giant tortoise. She made a large meatball out of sausage and had sausage legs and a head. She made a little bacon tail and propped it all up with wedges of sweet potato so it would cook in the right position. After tucking the bacon underneath and finishing off a very impressive likeness of a tortoise, Kristy looked at Dave triumphantly. With a smirk, she asked him if this was “exotic enough” for him. Dave had to concede that he had never been served turtle before and that it was indeed anything but plain old sausage. As expected, sausages wrapped in bacon are extremely delicious. Kristy obviously won the challenge on this round, but Dave made out very well too.